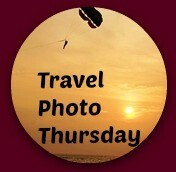 This is the 179th week for Travel Photo Thursday. Welcome! If this week is any indication, we are in for a long hot summer. The humidity is also on the rise. For me, that means trying to move a little slower, and dress a lot lighter! My favorite time of the year in Korea is spring. A month or so ago I shared some shots of the cherry blossoms, now I want to share some random springtime shots, which I think everyone will like. Spring in Korea really is a breath of fresh air. We seem to go from gray to green overnight. Life takes on an entirely different look. Here are some my favorite spring shots. 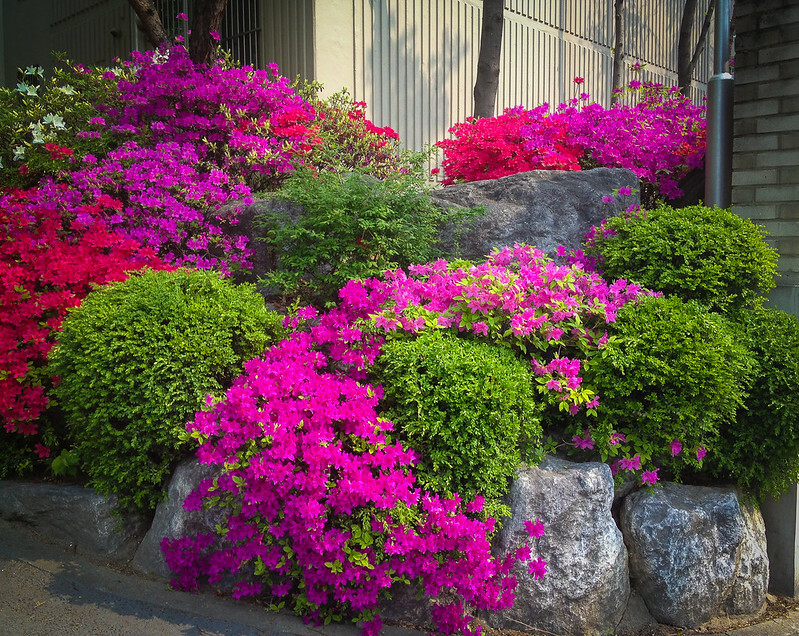 A burst of color at the entrance to one of the many apartment complexes here in Daejeon. 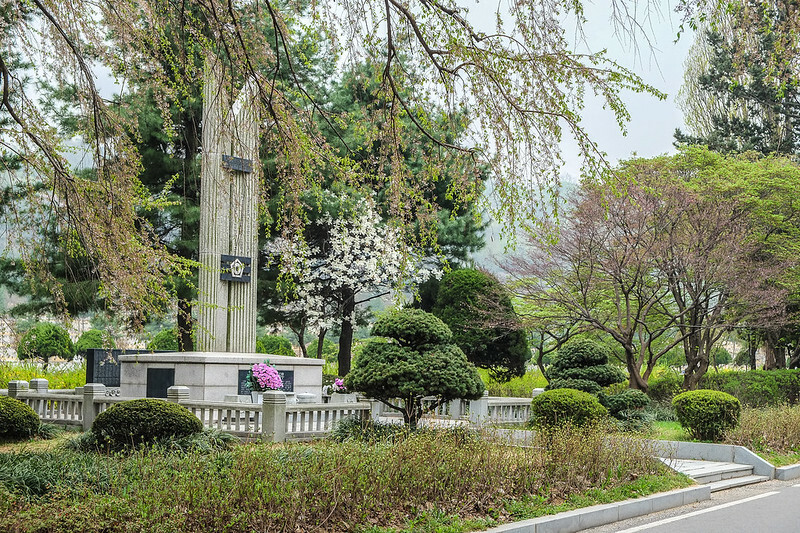 The Korea National Cemetery (Seoul) is famous for its weeping cherry trees. I missed seeing them in full bloom, but beautiful, none the less. 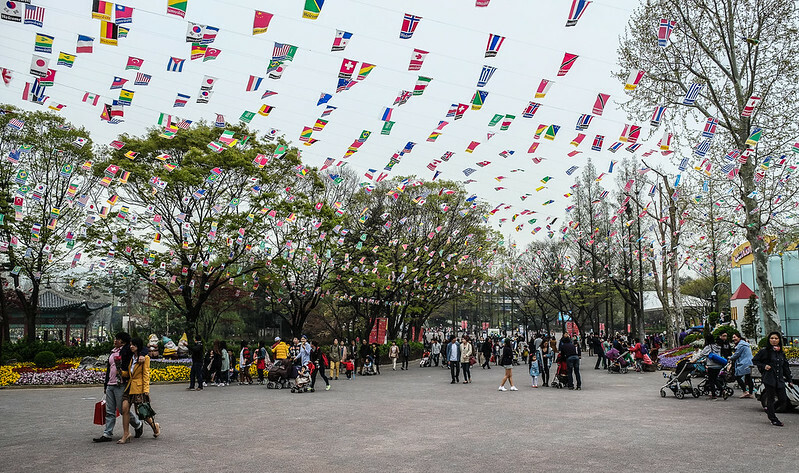 Seoul even has a park dedicated to children, Seoul Children’s Grand Park, and as soon as the weather breaks the crowds take over. Beginning late in April, they put on free concerts. That was my reason for the visit, and the big band music was fantastic. 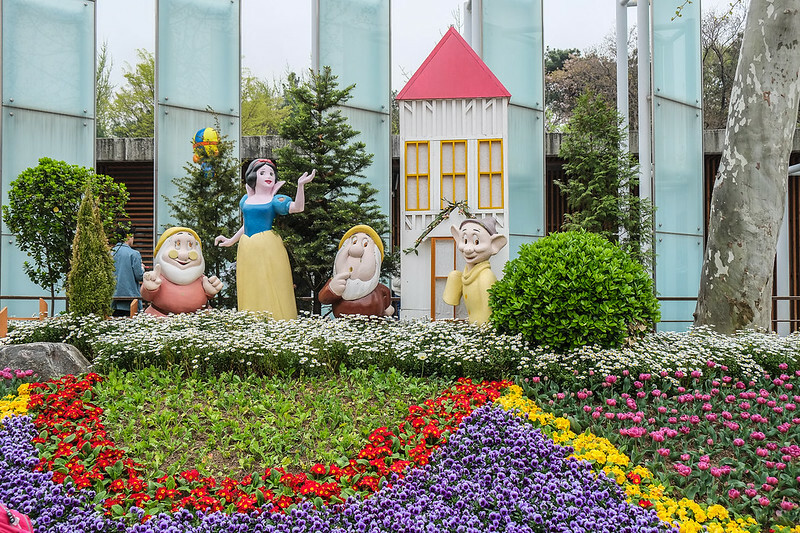 Snow White and her friends look happy, even if they are a long way from home! 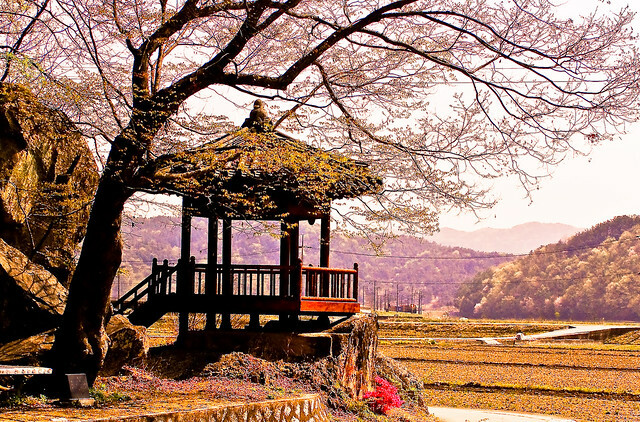 Taken on a 2008 road trip, and still one of my favorite Korea springtime shots. Thinking of adding Seoul to travel itinerary? While not as expensive as Japan, it’s not as budget friendly as many parts of South East Asia. Transportation and food are fairly reasonable. Accommodation can take a big chunk out of your travel budget, especially in Seoul. Deals can be found, but you need to look hard. I warn people off who want to come here in the summer or winter. Spring or fall are definitely the best time to travel here. If you want to come for the cherry blossoms, you need to plan ahead and you have to watch the weather. This is the 179th edition of Travel Photo Thursday. You can browse the archives here. These are absolutely beautiful, Nancie! I love the weeping cherry trees. Spring seems to arrive in Korea the same way it does here in NYC – one day cold/grey next green and hot. Unfortunately, it seems to be still a little fickle. We’re back to spring jackets today. Hi Marcia! We’ve moved into summer here this week. We’ve had plus 30 all week. I hope NYC sees some of the warmer stuff soon! Me too, Nancie. Warm temperatures are still teasing us. We wanted to barbecue yesterday but it got cool again and threatened rain so we moved indoors. Looks sunny this morning but I feel a chilly breeze coming through the window now. Fingers crossed, I’ll be writing about how hot it is soon! The flower colour at your door is so vibrant Nancie. I would love to come home to that display. It would put me in a good mood and make me glad to be home. The last photo is beautiful. 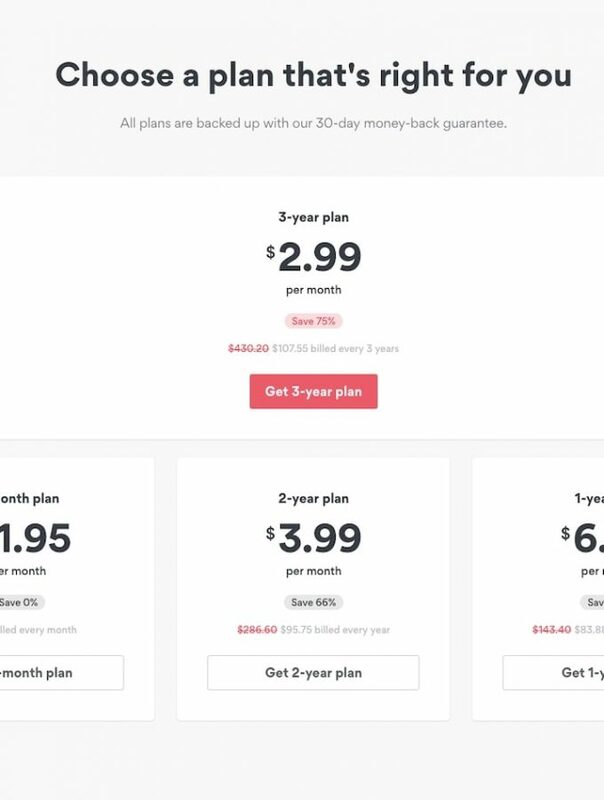 I think I have seen a similar one on your site before. Such a evocative sight. Hi Jan. Yes, love the color this time of year. I have posted that last shot before. It’s definitely one of my favorites. Spring has finally come to Minnesota as well, and is quickly turning into summer! Love all the flower pictures, but was most interested to find out that Seoul is much more expensive than most of the rest of SE Asia. I assume that also means that there is a lower level of poverty? Korea is much more developed than the countries making up SEA. Like everywhere, there’s poverty. Nothing like you see in SEA countries. Wonderful photos! Spring really does look beautiful in Korea :). it’s my favourite time of year anywhere, I think – so colourful after the winter. Hi Molly. I agree. I wouldn’t mind spring like weather everyday of the year. 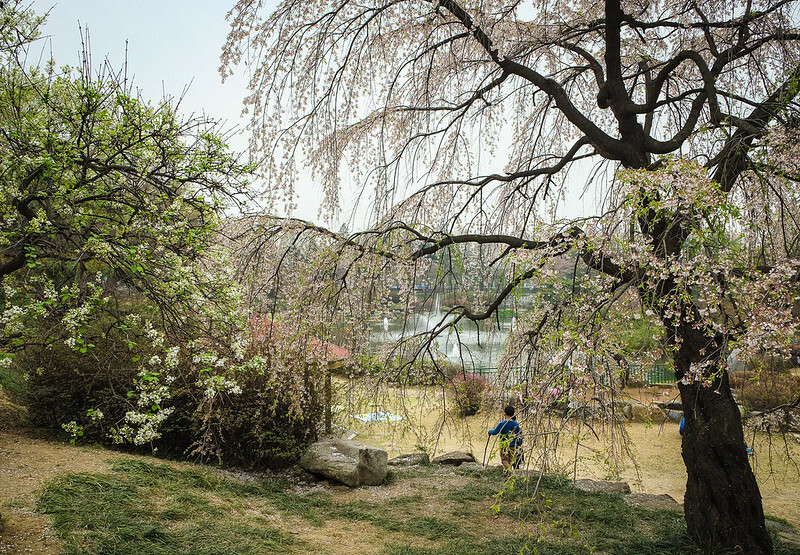 It seems the entire world is so ready for spring this year and your photo series is a reminder that spring blossoms and trees are stunning no matter where in the world you find yourself. Love the lone bloom. Have a great week and stay cool. Hi Jackie. I know that my Dad in Nova Scotia in more than ready. He tells me that temps are still as low as 5cel at night. That’s way to cold! Beautiful photos! Love those early spring flowers- especially that single white flower. Hi Tonya. Thanks. I was happy with the shot! I think that people all over were looking forward to spring this year — it was a tough winter for many. Just back from Wisconsin where the blossoms are finally coming out. Love your pics as they capture the beauty of the season so well. Hi Cathy. I know from talking to my Dad in Nova Scotia that they have had a hard winter, and spring is still struggling. Here I am this week at plus 30! Let me know if you decide on Seoul. We can try to meet up! Nancy!I agree, Korea in the spring is just gorgeous just as your photos show. I love late spring in most places…wildflowers and greenery! Lovely. Hi Anna. Of course, I often forget that it’s always fall or winter somewhere! 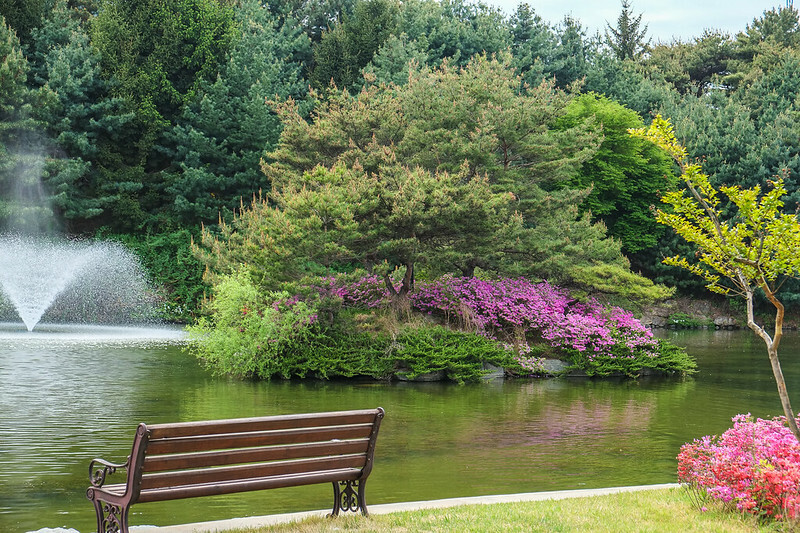 What a great collection of Springtime photos! These are so colorful and beautiful and I especially love the flowers.Beautiful! Hi Mary! 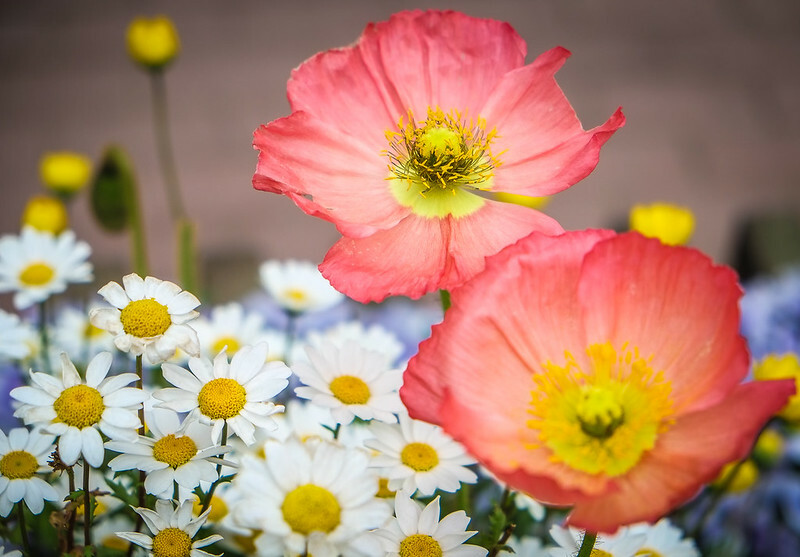 There’s nothing like spring flowers to make a person feel good! A lovely photo series, and some handy advice, Nancie. I remember you posting that last photo previously, and it’s still just as wonderful. It could be in a travel brochure for visiting Korea in the spring. I like all the flags at the Children’s Grand Park, and you are very lucky to have that display of blooms by your apartment. 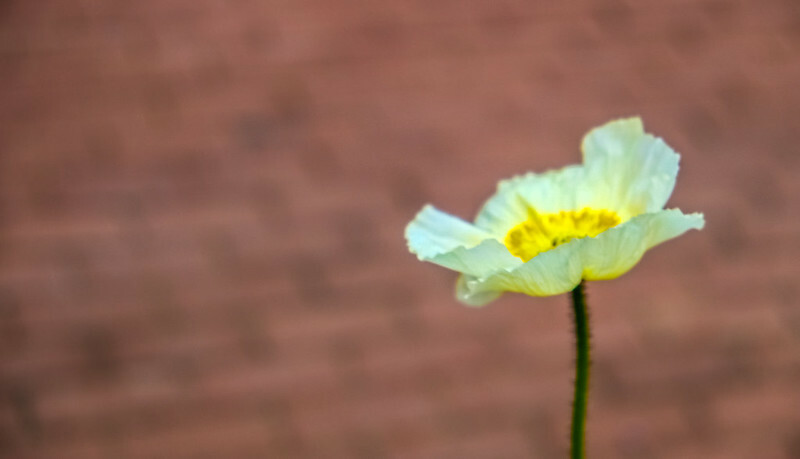 Is that a white poppy? It’s funny what you say about the humidity. My son was suggesting going to Italy this summer but was concerned about reports that Italy is hot in the summer. I told him that seeing as how we live on a hot, humid island and had just returned from even hotter Cambodia, we could totally handle Italy.